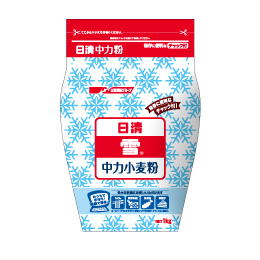 In Japan, flour is generally categorized in 2 main varieties and you should choose them according to your usage. 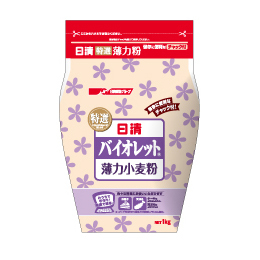 Hakurikiko (薄力粉）- Weak flour/Soft Flour - This is for baking cakes and biscuits and for general use. It's low in protein content (less than 8.5%). 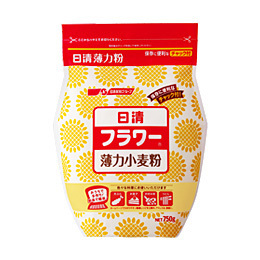 Chuurikiko (中力粉）- Medium strength Flour - This is used for Udon making, Takoyaki & Okonomiyaki. It has about 9% protein strength. ZenryuFun (全粒粉） - Whole wheat flour. 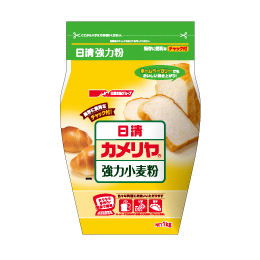 日清(Nissin)is the major manufacturer for flour in Japan usually dominates the shelf. Self raising flours are not sold in Japan, but you can make them with Hakurikiko (Weak Flour). Just add 1 teaspoon of baking powder to each cup (Japanese 1 cup is 200ml) of Hakurikiko. If you are using it in a USA recipe add 1/4 teaspoon salt. If you are using a UK recipe you don't have to add salt as the self raising flour in UK does not contain salt.